We tested a number of Kay’s Naturals cereals and Cracker and were quite impressed with the flavor and nutritional content. All the products have a high protein content with approximately ten grams of protein per 1 oz. This is very impressive. Before getting too involved in testing such a variety of products, as I felt so many of these would great for kids, I needed to ensure the purity of the products. I had the opportunity to speak the owner and founder, Dr. Massoud Kazemzadeh (Dr. Kay), and I asked all my questions with the end result of being well-informed and at ease about pursuing the testing personally and with other celiacs. The doctor informed that all his products test under 5 ppm, and his facility became 100% dedicated GF two years ago, as he concluded this was the best way to go since the company manufactures only gluten-free products. Prior to that, a few of his products tested near 30 ppm and he was at a loss as to where this high count was coming from. He had every ingredient tested and all came in under the 5 ppm, except his source for almond flour. Since then, this has been resolved and he’s had standards set which are very well known. He assured me his soy isolate is the best, as its source is Solae, where they produce soy and nothing else. With my mind at ease, I proceeded to test the products, and I was more than impressed with all I had at hand. The cinnamon toast pretzels taste like mini “cinnabons.” 1.5 oz. has only 9 g carbs, 10 g protein and 6 g sugar). Any child or adult would enjoy these as a quick pick-me-up snack. They have a large assortment of crackers which are extremely impressive with names like Crispy Parmesan, Chili Nacho Cheese, and Lemon Herb, etc. My testers felt their cheese chips were the perfect substitute for the long-gone Cheese Nips, which they can no longer eat, and I agree. Without a doubt, kids will enjoy these snacks of approximately 150 calories and 15 g of protein per bag—incredible! The cereals are much like Cheerios, but better, and come in a variety of flavors and taste delicious alone or with fruit on top. We all agree that Kay’s Naturals (Dr. Kay) has a heartfelt story to share along and deserve our accolades for their products, taste, nutritional content, and well-packaged simple portion sizes. He saw his wife’s suffering with her illness and saw the need for good products for the diabetic market. He shared his views with Linda and they agreed to start a company offering healthier options. They registered “Kay’s Naturals,” and he began creating prototypes. Unfortunately his wife passed away from complications with diabetes. Years later, Dr. Kay’s and Linda’s dream was rekindled, and he understood the dire need for healthier snacks and cereals and the need to help diabetics. Dr. Kay is remarried to attorney Ann Jones who eventually took over the company, pursuing the plan Dr. Kay and Linda created, and now Dr. Kay can devote time to product development. They currently offer 12 gluten-free and diabetic-friendly (low-carb and low-sugar) products, and he assures me he has no intention of quitting. He is proud to state that his products are now staple in diets addressing obesity, another concern he’s currently at the helm of. This company, the food, and this incredible man, Dr. Massoud Kazemzadeh (Dr. Kay) are to be commended for exceptional products and purpose. I love Kay’s Naturals too! I have been eating them for quite a while and I think they have gotten better and better. on behalf of my three-year old son, Kay’s Naturals, Better Balance Protein Cereal – Apple Cinnamon is just about the tastiest food on the planet! He eats it in a bowl with milk for cereal in the morning, out of a baggie as a snack after school, etc. He loves the taste, and as a mom, I love the healthy ingredients and especially the great source of protein in one serving. I LOVE Kay’s Naturals, Better Balance Protein Cereal – Apple Cinnamon. My four boys could eat this all day every day if allowed, and I have no concerns about that because it is full of good, healthy ingredients, and is an awesome source of protein, especially for a cereal. This cereal is GREAT! Tastes like Apple Jacks, but mom let’s us eat it. I wish I could eat it every day. I love Kay’s Naturals Apple Cinnamon Protein Cereal. It tastes like Apple Jacks, without any green colored rings. I would like it every morning. Kay’s Apple Cinnamon Protein cereal – Yummmmmmmmmmmmm! This company is soooo awesome!!! There is so much protein packed into their little snacks. I actually feel like I’m becoming more healthier from just eating these! I love the cereals. They are the first cereals I can actually just snack on instead of putting them in a bowl of milk. great on the go too! I love the different flavors of chips. They are great for when I’m starving but can’t get my hands on a real meal! This chips totally hold me over. They taste like regular cereal but without ALL THOSE carbs. I like how you can get some good protein from it so you don’t feel like it’s a guilty pleasure to snack at night. Fantastic chips for hikes. the flavors are all good. I can’t stop eating them! Okay so like little cinnabons??? I’m so trying this. I miss Cinn a Bon sooo much! I put the mini cinnabons in milk and eat it as a cereal!!!! Does anyone else do that with Kay’s Naturals? 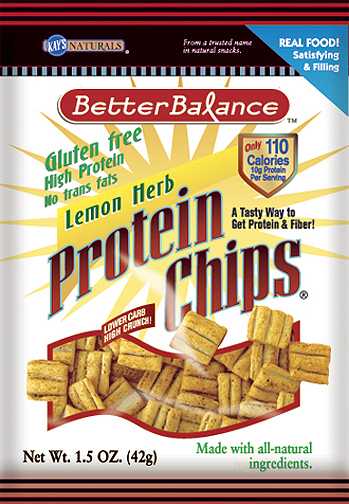 These were very yummy, It was great to have protein in what that tasted like a treat. Kays treats are a winner. For me – cereal has evolved from a breakfast food into a snack, so the smart balance cereals are perfect since those have protein in them plus many other vitamins … makes eating on the go soooooo easy. I remember the days of eating chili cheese frito lays but those are long gone now… so sad for me… but now that I’ve read this review and see that there’s chili nacho cheese crackers, perhaps I’ve met the ideal substitute? Can’t wait to try them! Incredible products that don’t sacrifice taste. I serve these up to friends, patients, family, etc. and 1 for 1 they love the chips and ask for the brand name. What a great snack line. Thanks for posting this review. We’re taking our 2 kids for a road trip (they have celiac) and we’re working on stocking our food supply with GF snacks. These will do just perfectly! I loooove cinnamon treats and Kay’s Naturals makes you feel like you’re indulging in the worst-for-you imaginable cinnabon-like treats but they’re GF and filled with protein! The Nacho Cheese flavor absolutely reminded me of cheese nips, but possibly better. They really leave you with a good-for-you feeling that you just had something healthy, something cheese nips never did for me! Someone suggested above eating the cinnamon snacks in milk like a cereal, so I made a hot cereal (warming it up in milk on the stove) with the cookie bites, and they were pretty good! It’s always great learning the backgrounds of these companies and their owners. Always an interesting read! Thanks, Tina. It’s so nice to hear about the good causes behind products such as Kay’s Naturals. I’m not Diabetic or obese or even celiac, but I like eating gluten-free because it makes me feel good. Hearing the stories behind these products makes me really appreciate the fact that these are on the market. Hey there, Tina. Thanks for highlighting this product. I’ll be picking up some boxes of Kay’s for sure.